On Sunday, November 18th, a University of Vermont class together with the Batey Libertad Coalition (BLC) held the 6th BLC Soccer Tournament at Batey Libertad. Special guest Emmanuel “Manno” Sanon — World Cup Footballer and Haitian Athlete of the Century — was in attendance to give the Batey Libertad men’s team a pep talk that carried them through the finals, where they held on to a 1-0 lead against “Plantaciones del Norte”. Many of the UVM students hadn’t found their “Haitian stomachs” just yet, illing from some home cooking the day before, but three Vermonters did take the field. Father-son duo Lucas and Gary Hawley joined forces in the final, and UVM medical student Ryan Sexton helped Batey Libertad reach the finals with a penalty kick during a qualifying round shoot-out. 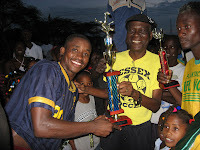 The Batey Libertad Coalition is a partnership between Haitians, Dominicans, and Americans to use the sport of soccer as a catalyst for social change at Batey Libertad and the surrounding communities. 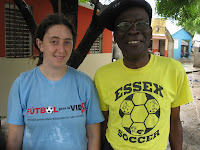 The BLC was founded by a group of University of Vermont students and soccer players from Batey Libertad whose shared love of the “beautiful game” has helped to organize community resources, inspire the next generation of community leaders, and break down racial prejudices between Dominicans and Haitians. Batey Libertad has both men’s and women’s soccer teams, as well as programs for young boys and girls. Today they are a soccer powerhouse in the Esperanza-Mao-Santiago r egion, and have helped organize and outfit other teams in the surrounding area with equipment collected by US soccer clubs and school programs. BLC Vermont partners include Essex United Soccer Club, Capital Soccer Club, and Far Post Soccer Club, and during 2007 benefited from equipment drives at high schools and universities in New York, New Hampshire, Massachusetts, and Illinois. For more information on the Batey Libertad Coalition, how to organize a soccer equipment drive, or raise money for Batey Libertad programs through annual juggle-a-thons, please get in touch with John Antonucci of Capital Soccer Club, UVM alumni and co-founder of the BLC.